Shut The Fridge: What Makes a Fish a Fish? We got a fun DVD to review that is part of a series called Dive Into Your Imagination. 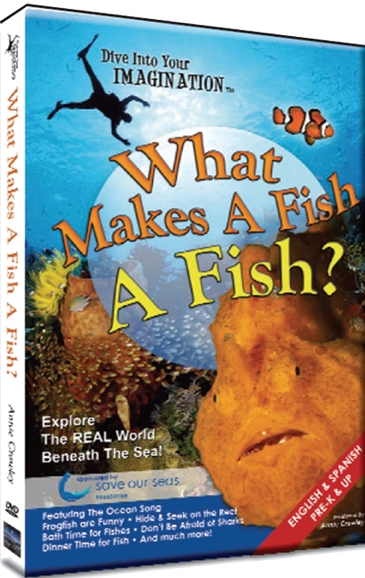 The DVD we got was What Makes a Fish a Fish? I let A-man pick which one from the series that we wanted to watch, because he is in the targeted age range of 1st through 3rd grades, and, he is the most obsessed with under water things. Well, okay, not "things".....just sharks. These movies were filmed and narrated by Annie Crawley. Annie has been an underwater photographer, dive instructor and boat captain for more than 15 years. There is a lot more to her than those few descriptive words and she is available for speaking engagements. Go take a look around her website and see everything she has done. It is pretty impressive. Like I said, the DVDs are fun to watch. Fascinating. Beautiful. Creepy sometimes. But, this being a homeschool family, we have to take things a bit further and do some learning along with our watching. That is why it was so great that an Educator's Guide came along with the DVD. Although, I will admit, much of it is geared toward an actual classroom setting....I am used to adapting things for use at home, so it wasn't a big issue for me. And, let me tell you, they packed the learning opportunities in like sardines! Stop, Think, Breathe slowly and then Act!" Isn't that awesome advice? It is actually quite useful to this mother of six.....everyday. Science, Geography, Communication Skills, Math and Character Education. But, you know what? I was surprised. They actually did and it made sense. Did you know that Scuba divers use math and physics to calculate dive time and depth limits? I know. Once you hear it, it makes total sense. The DVD is arrange in chapters, each chapter has a corresponding lesson in the Educator's Guide. You are supposed to watch one chapter of the DVD and then work through the activities. Rebels that we are, we watched the whole thing first (it was just too fascinating)....then we went back and did each chapter and its activities. Each unit in the guide provides several learning station activities, they suggest choosing 2-3 of them for use at a time. By several....they mean....a lot. Really. Just choose a couple. The text/transcript from the DVD is provided so you can select words or review content as needed for use with your kids. They suggest that you could even have them practice reading the script and then create their own story based on the script. Please note that a script for a DVD is not necessarily grammatically correct, if reviewing from a language/literacy point of view. Scripts are created so they sound correct to the listener. Isn't that funny? Maybe just to a homeschooler. I don't think most people think that way. Most people would just watch the movie....not try to use it to teach language and literacy! Back to the learning activities you can do with the DVD. There are simple options, like coloring pages and identifying what makes a fish a fish or things like word scrambles and seek and find. But, there are things sprinkled in that older students would enjoy and learn from too. They can write about where in the ocean their fish might live: cold or warm water; a coral reef or kelp forest; deep water or shallow.....you get the idea. Or, the one I would like to try.... Bioremediation Observations on methods used to clean up an oil spill (that you create in a bowl for them). There are fun math activities - like using rainbow colored gold fish....separating them....then counting them....then adding purple plus yellow fish, purple plus yellow plus orange.....plus lots of word problems relating to the world beneath the sea. Seriously, they relate every single one of those character traits to what is going on in the DVD. Really. There is also section in each chapter on "Ocean Annies How to Help Our Environment"....with suggestions for projects you can do to help the environment. More information is available at Save Our Seas. Oh, and for you moms that are like me out there. There is a teacher key included that has the answers to all the activity questions. The Educator's Guide will soon be available for purchase ($69.95 for individual guides or $299 for the complete set of guides for all the DVDs). Buuuuutttttt......right now, blog readers and followers of The Old Schoolhouse or The Homeschool Crew can receive the educator guides free with the purchase of the DVDs. Just mention that you are a homeschool parent when you order the DVDs! So? What does make a fish a fish? I am so glad you asked....because I know the answer now! In order to be a fish, an animal must live primarily in the water, be a vertebrate (with a skeleton), use gills to breathe, have fins for propulsion....and a mouth. Never thought about making sure it had a mouth before. Take a look and see what other TOS crew members thought of Dive Into Your Imagination DVDs. Disclaimer: I received a copy of What Makes a Fish a Fish? and the download for the Educator's Guide for free in exchange for an honest review.